Not everything is closed on Mondays- here’s a selection of worthwhile places and shows that can be viewed when the options seem limited. "The Lady and the Unicorn from the Musée de Cluny, Paris, France"
A while ago I met a group of curators on a brief visit to Tokyo in order to attend a symposium. After the symposium, held on a Sunday, I asked them, “What are your plans for tomorrow?” They answered with a heavy sigh that they wished to see some art before they returned to Australia but they’d heard Monday was the day when most Tokyo art museums and galleries are closed. For the most part, this is true. However, with a little bit of research it’s possible to find venues. Here is a list of 10 venues and their current exhibitions, all of which can be viewed on Mondays. One of Tokyo’s most architecturally impressive museums, the NACT is definitely one museum not to be missed. It is one part of what is known as the Roppongi Art Triangle; the other parts, Mori Art Museum and the Suntory Museum of Art, are located close-by and are also conveniently open on Mondays. Right now, NACT is showing The Lady and the Unicorn, a gorgeous set of medieval tapestries from the collection of Musée de Cluny, Paris. Closed on Tuesdays. Not only is the Mori open every day of the week, it is open until 10pm on most nights. “All You Need is Love: From Chagall to Kusama and Hatsune Miku” is an exhibition made with first dates especially in mind and it’s on right now. This Tokyo Midtown venue is devoted to design. 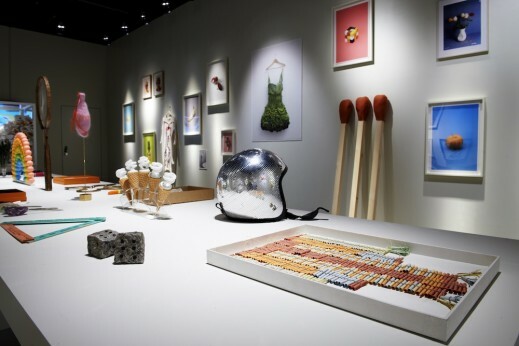 The current exhibition, “Design Ah!”, has been a real hit. The review can be read at TABlog. This is the last weekend for the exhibition. Closed on Tuesdays. This gallery, located inside the Diesel clothing store in Shibuya, has had an interesting list of exhibitions so far. Studio Africa, Karen O’s stylist, avant-garde makeup, and the current exhibition of works by Sarah Illenberger are a taste of what this small space offers. Illenberger is a German designer known for her surprising and funny arrangements. Open every day except for irregular holidays. This department store has plenty of art going on. Check out Daifu Motoyuki’s display of photographs of his typical Japanese family’s cramped living space, just published in a book called “Project Family”. Open every day. If you head bayside you can look inside the cavernous Yokohama Museum of Art and take a peek at their current show, “Welcome to the Jungle: Contemporary Art in Southeast Asia”. It’s a very interesting collection of works from Singapore Art Museum that, despite the English title, mostly avoids cliches about Southeast Asia. Closed on Thursdays. This Shibuya museum is found in the same building as Tokyu department store’s main branch on Dogenzaka. The exhibitions are usually small shows of old masters, along the lines of Breugel, Reubens, or Vermeer. The current exhibition is of the the extremely mimetic paintings of Antonio Lopez. Open every day. On the other side of Shibuya station, in the new Hikarie department store, is Tomio Koyama’s Shibuya branch of his commercial gallery. In fact, the entire 8th floor is filled with exhibition spaces, meaning there is always something to see. Lee Youngbin’s delicate drawings using traditional Korean paper and inks are on show until June 3rd. Open every day. The gallery inside the flagship Hermès store in Ginza often offers well-curated exhibitions. Right now, you can view the often confronting work of Sigalit Landau, an Israeli artist whose work is often about the painful past and present in her country. “The Ram in the Thicket” is a surprisingly political show for such a commercial location. Closed on some Wednesdays. This lovely gallery space not only has a quality exhibition program but also comes with a view of the rooftops of Tokyo. The current exhibition is a solo show by Thomas Bayrle, “Monuments of Traffic”. Open every day except for irregular holidays. It’s worthwhile knowing too that some of these exhibitions, when they’re not free, come with a discount admission price when using the Mupon app.